Torque measurements are critical to process control and monitoring. Tightening torque of threaded fasteners, motor output horsepower measurement, and industrial automation processes are just a few of the common applications requiring repeatable and accurate torque measurements. Many torque measurement applications require the measurement to be taken at a rotating shaft or a stationary motor. The first step in choosing the right torque sensor is to define the required location of the torque measurement. Often times, a simple flanged reaction torque sensor mounted directly to a motor or test stand will suffice. If the torque measurement must be taken in line with a rotating shaft, a rotary torque sensor is required. A rotary torque sensor is fitted with a slip ring or wireless electronics to transmit the torque signal while rotating. More often than not, the torque measured with an in line rotary torque sensor may be measured at the point where the torque is transferred to ground using a reaction torque sensor. For a given application, a reaction torque sensor is often less complex and therefore less expensive than a rotary torque sensor. Reaction torque sensors require little to no maintenance, often outlasting the other test components. Also, installation of a reaction torque sensor is often less complex than an equivalent rotary torque sensor. Rotary torque sensors may require keyed shafts, hex or square drives, or shaft to shaft couplings, whereas a typical reaction torque sensor is mounted on either end of flanges using cap screws. If an in line rotary torque sensor is required, Sensing Systems has a complete offering of sensors with brush and brushless slip rings. We also offer telemetry systems for wireless communication of the torque signal. Once the type of torque sensor required has been identified, the sensor specifications must be defined. Along with any overall size or attachment requirements, a customer must specify the following: full scale capacity, operating environment, operating temperature, output type, accuracy, bridge resistance, etc. If a rotary sensor is required, the maximum rpm must be specified. Any off axis moments, or compressive/tensile forces acting upon the sensor must be specified to ensure the sensor is capable of withstanding these loads safely while still outputting an accurate measurement. 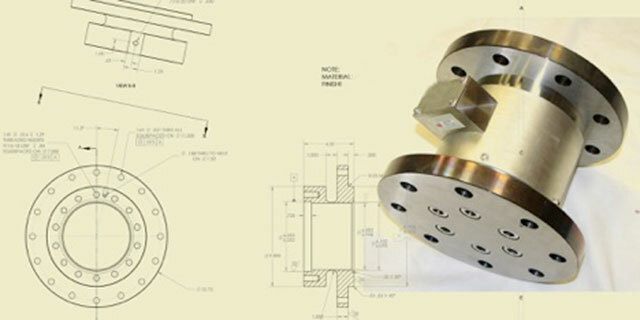 Sensing Systems has developed techniques to manufacture extremely accurate torque sensors which can be simultaneously subjected to high off axis moments and other forces. At Sensing Systems, we specialize in the manufacture of both reaction torque sensors and rotary torque sensors. If needed, we can custom design and manufacture a sensor to fit within your existing test assembly requirements. We manufacture miniature 1 in-oz torque sensors and high capacity torque sensors up to 1,000,000 in-lb. We offer integrated encoders to measure rotational speed or position as well as complete measurement systems with digital displays, digital or analog output signals, and data acquisition modules. We are the market leader in submersible measurement applications such as underwater oil drilling and submersible pump torque measurements. In addition to torque sensors, we offer strain gaging services to measure torque and horsepower. Often times, requirements are such that integrating a sensor is impractical or impossible. In this situation, in-situ strain gaging of an existing component may be the best solution.